Ladin Country, Sud Tyrol, Italy. Kronplatz a new venue for us. As you travel around the European Alps you come across areas which seem to belong to another era and others that speak a dialect so strange that although you can recognise the core language, it's simply impossible to even begin to understand what anyone is trying to tell you. From France, where the locals speak so fast that I have no chance of any decryption, to Austria and Saalbach, where there has been so much foreign influence that the German is simple and easy going, enough to grab a quick word or two. Onto Alpbach where the dialect is hard Austrian and finally to Ladin country, where the language is all of its own and spoken only by 20000 people in total. Hear Ladin in full flow, it’s nice to hear, but totally in a world of its own. So to St Vigil, Sud Tyrol, Italy, Ladin Country, at the very head of a valley this lovely little town is a little gem if you want quiet and unsophisticated village life, it's bigger than you may imagine and is quite full of very high quality hotels ( check out Hotel Carmen a 3 star hotel punching well above its weight with its; 5 course meals, huge rooms, top wellness area and friendly staff, all for €78 a night, now if you want to impress the girls, lads ! ), small ski shops and better still, right on the edge of the Kronplatz ski area and with a 20 minute free bus ride, Alta Badia and the Sella Ronda the other way. The usual big church surrounded by a small number of shops and a limited number of bars and pizza style restaurant’s, typically Italian but with that Tyrol flavour. Got the picture, it’s nice, well worth a visit summer or winter. Do check out the local red wine, it’s stunning, available only locally and unfortunately not available in the UK, damn. 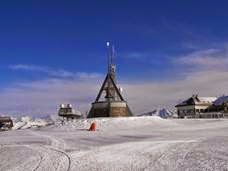 So what is the ski area of Kronplatz like for a skibiker? Well get your arses there and give it a go, if you are beginning to skibike and want a friendly easy area then you can’t go wrong; American boulevard skiing at its best, long blues and reds, all very flattering and carefully maintained. Black runs that are, well, tough reds in reality, are long and would be a challenge to the average skibiker, tough enough to test you but wide enough and with an escape route at the halfway points to let you off if needed. Be careful of the St. Vigil side black run towards Piccolino, at the top it has a quite a steep pitch of about 200 metres, most skibikers would struggle, particularly in the mornings when it was very icy as we went down heading for the buses that would take us into the lifts of Alta Badia, which incidentally as far as I’m aware, are not skibike friendly. Add in all new bubble lifts everywhere, main line train stations built into the base of the lift system at Perche, a social après ski area at the base at Bruneck and loads of Tyrol style mountain restaurant’s, it’s quite a gem. Looking at the ski map it may look small, but the area is vast, some of the runs are over 8km long of 100m wide piste, real French 3 Valleys style, without the expense and vast numbers of people. There are some downsides of course, the mountain is just like a big upturned ice cream cone with the lifts all ending at the top plateau ( where there is the Concordia 2000 peace bell, one of the biggest active bells I have ever seen and well worth the wait at 12.00 o’clock to see it wind up and chime the requisite 12 chimes of noon ), its tree sparse at the top and the piste so wide that in poor weather it could be a problem. Equally because the piste are so wide and even, you find yourself thinking that you are skiing out the area quickly, although in reality you are just scratching the available area ( remember the Dolomite Superski of which Alta Badia is part of, is 1200kms of piste and over 400 lifts ) . Also because the pistes are wide, every available run is groomed and hence off piste is quite limited. Be careful also about when you want to visit, it’s quite a long way South and will close late March if Easter is late as per this year. All in all though a gem of a place for skibiking and well worth a visit.